We're tasked with making interfaces for more users in more contexts using more browsers on more devices with more screen sizes and more capabilities than ever before. That's a daunting task indeed. Thankfully, design systems are here to help. Atomic Design details everything that goes into creating and maintaining robust design systems, allowing you to roll out higher quality, more consistent UIs faster than ever before. This book introduces a methodology for thinking of our UIs as thoughtful hierarchies, discusses the qualities of effective pattern libraries, and showcases techniques to transform your team's design and development workflow. To boldly go beyond “pages.” That’s the universe of modern design, and there’s no better guide to exploring it than Brad Frost. 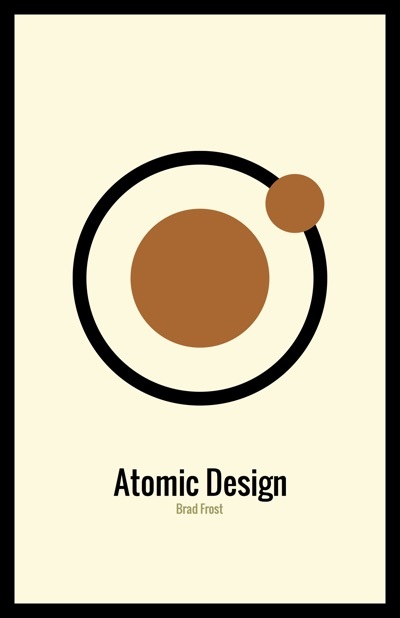 In Atomic Design, he replaces our outdated, closed workflows with exciting new collaborative ones, and teaches us to design not just pages but systems. Recommended for all web and interaction designers. Brad is suggesting that we’d be better web designers if we thought of what we’re building as a system. A hierarchical system that ts together to form larger parts. Because, spoiler alert, it is and we would be.